Law for Life / What's new? Read the latest news, updates, interviews and opinons from Law for Life. Law for Life’s new project with the Gender Identity Development Service (GIDS), based at the Tavistock and Portman NHS Foundation Trust, is well underway. GIDS is an NHS specialist service for children and adolescents experiencing difficulties with their gender identity. 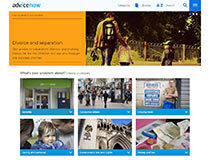 Law for Life’s Advicenow service is producing new guides to help people avoid and deal with benefit sanctions. To help make sure the guides are as good as they can be we are looking for volunteers to review a draft of the guides, and give us their feedback. We carried out a survey of staff at a mental health trust to help us better understand the barriers and challenges that people with mental health problems face when experiencing benefit sanctions, as part of our new public legal education project to help people build the skills to avoid benefit sanctions. Last year Law for Life worked with trusted intermediaries from 89 different organisations in order to equip them to support their service users on a range of legal legal issues. We are looking for an enthusiastic and creative volunteer Media and Marketing Assistant, with good knowledge of social media. Law for Life is delighted that funding from the TDS Charitable Foundation has allowed our public legal education website Advicenow to develop short, practical and easy-to-use information for students and young people in England about guarantors. In advance of the Homelessness Reduction Act 2017, we will be expanding our housing resources to help people understand how to deal with local authorities when they are at risk of homelessness. Law for Life is delighted to announce a new project with the Gender Identity Development Service (GIDS), based at the Tavistock and Portman NHS Foundation Trust. GIDS is an NHS specialist service for children and adolescents experiencing gender dysphoria. It is with deep sadness and a personal sense of loss that we record the death of one of our founding patrons, the Rt. Hon. Sir Henry Brooke, on 30 January 2018. Law for Life is delighted to welcome two new Trustees to join the Law for Life Board during an exciting time for public legal education and in a challenging climate for access to justice. Mr Jon Spain will be our new Treasurer and Mr Joe Broadway joins us as a Trustee. Law for Life has launched a new teaching guide- Section 21 eviction notices: learning about the process and developing strategies for dealing with private rented housing problems. We are delighted to announce our new DLA tool. As part of HM Courts and Tribunals Service’s reform programme, an online court will be created, which will require a new set of rules. Law for Life’s CEO Lisa Wintersteiger was pleased to give evidence to Lord Bach’s Commission on Access to Justice. 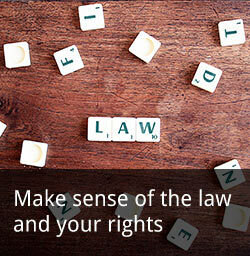 Law for Life has recently delivered a full day’s training for private renters, and organisations who support private renters such as tenants’ rights associations and small/medium size charities. An article by Francesca Feruglio, co-founder of Nazdeek. A great guide to help you step by step with a grievance procedure at work. Dealing successfully with a Personal Independence Payment appeal guide and our PIP Mandatory Request tool. How do we teach about the law? Tara Mulqueen and Tony Thorpe: a reflection on their method of teaching public legal education at Law for Life. Parental responsibility – what it is and how to get it. A Law for Life report analysing the findings of the 2010 and 2012 UK Civil and Social Justice Panel Survey.